Summer is a wonderful time of year for salad lovers. 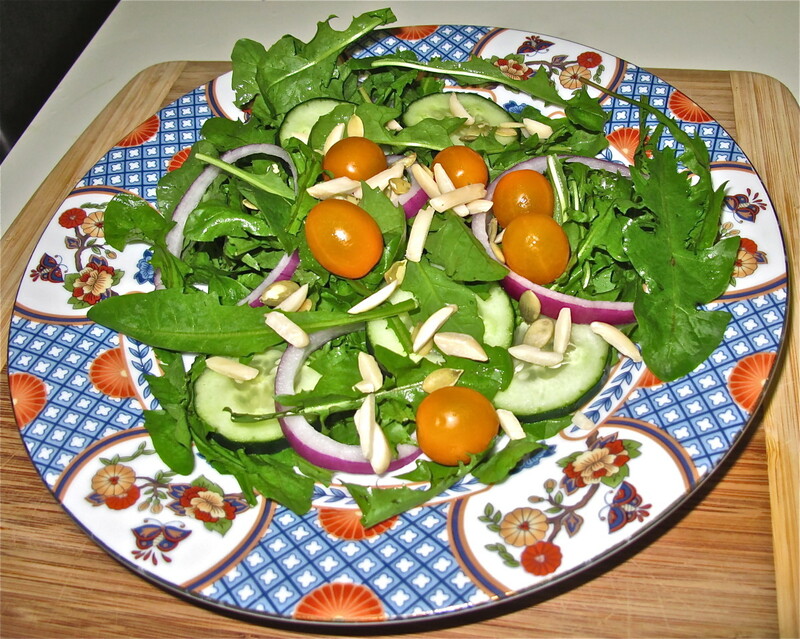 In summer, the widest variety of salad greens is available. 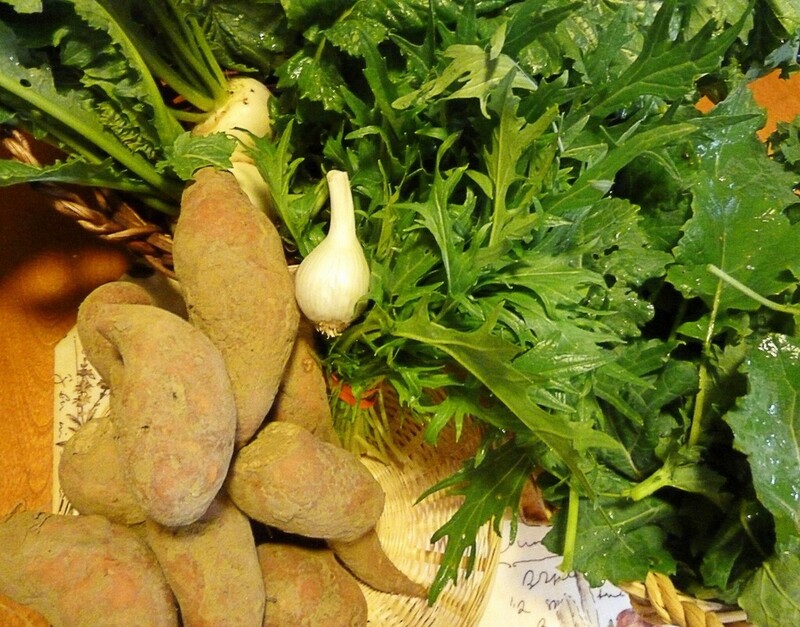 Fresh greens from gardens or markets are tasty and very nutritious. Three interesting and tasty plants that can be found in non-traditional markets and sometimes in traditional ones as well are purslane, mizuna, and tatsoi. In North America, purslane can also be found growing in the wild. 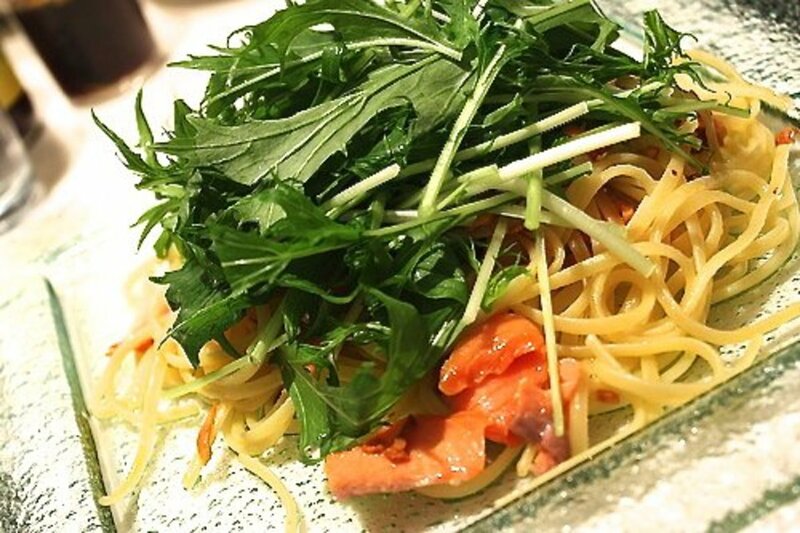 In some areas, mizuna and tatsoi are available all year long in prepared salad mixes. When you’re buying salad greens, don't restrict yourself to iceberg lettuce, which is sometimes nutritionally poor compared to darker greens. 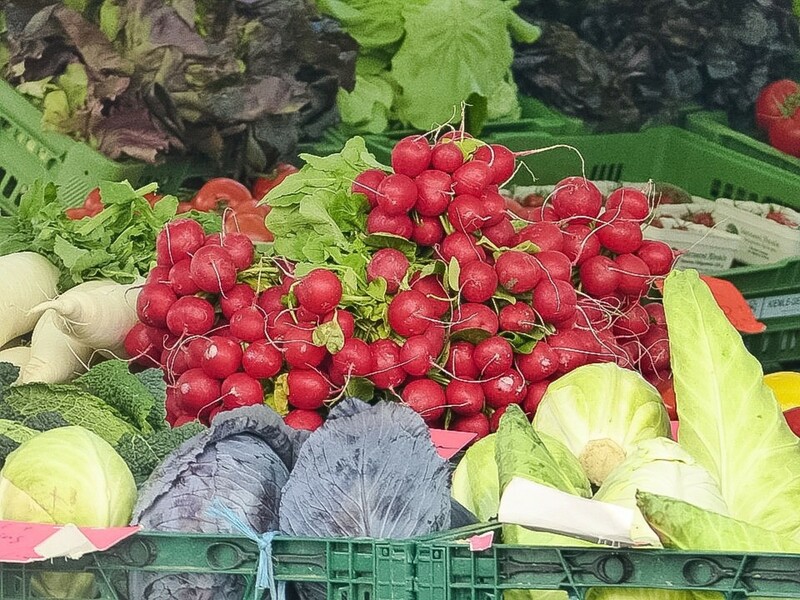 In addition to visiting your local supermarket or corner store to buy vegetables, try to find farmers markets, organic food stores, and Asian markets. These are all good places to discover new types of plants to add to salads. The best source of fresh purslane, mizuna, and tatsoi that I've found is my local farmers market. The plants would be even fresher if I grew or picked them myself. The darker colored salad greens are rich in beta-carotene, which our bodies convert into vitamin A. They are great sources of folate as well. Folate is one of the B vitamins. Greens also contain other B vitamins as well as vitamin C. Some leafy greens are good sources of Vitamins E and K. In addition, salad greens contain important minerals such as magnesium, potassium, calcium, iron, manganese and zinc. 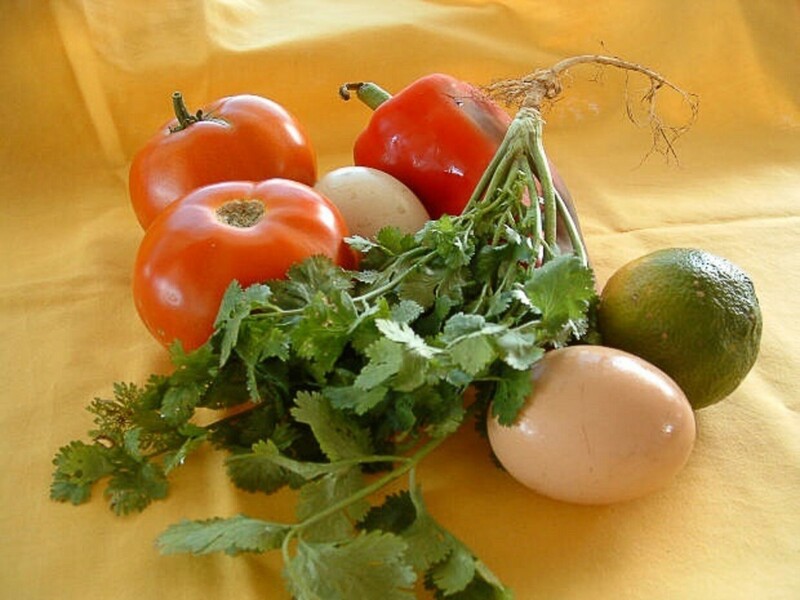 Green vegetables contain beneficial molecules known as phytonutrients or phytochemicals. Unlike vitamins and minerals, phytochemicals are not essential for our survival but are believed to reduce the risk of some diseases. It’s important to eat a small amount of a healthy oil with salad greens, since nutrients such as beta-carotene and vitamins E and K are fat-soluble. They need the presence of fat in order to be absorbed through the lining of our small intestine. Healthy fats and oils also have health benefits of their own. Purslane is a popular food in the Mediterranean region. 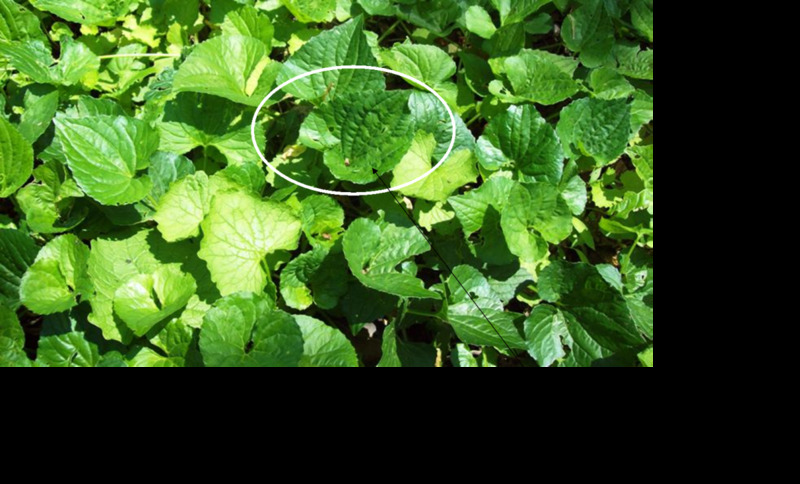 It grows wild in the United States and Canada and in many other parts of the world, where it's often regarded as a weed. It's a small plant with thick, succulent stems and leaves and yellow flowers. It reproduces from stem pieces as well as seeds. Purslane has a great ability to survive drought. Its seeds can survive in the soil for many years. It can be a hard plant to eradicate. Some people who know about purslane's nutritional benefits don't want to eradicate it, however. If you plan to gather wild purslane for food, remember to be absolutely certain of the plant's identification before you harvest it. In addition, don't eat plants from an area that has been sprayed with pesticide or is close to vehicle traffic. Cultivated varieties of purslane can be bought from garden stores. Some people think that cultivated purslane tastes better than the wild kind, while other people have the opposite opinion. 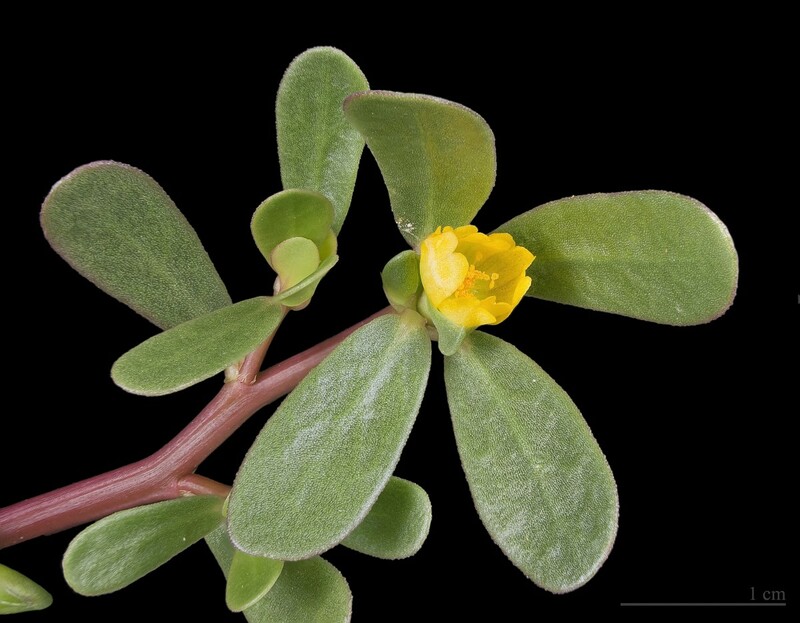 Both the stems and the leaves of purslane can be eaten. They have a crunchy texture when raw and have a sour, tangy and slightly peppery taste. Purslane is a good source of antioxidants, including beta-carotene, vitamin C, and vitamin E. Antioxidants help to prevent cell damage caused by the free radicals produced during oxidation. Purslane also supplies us with calcium, magnesium, and potassium. It contains a significant amount of alpha-linolenic acid (ALA), which is a type of omega-3 fatty acid. ALA is an essential fatty acid—one that our bodies cannot make. It's believed to play an important role in preventing heart disease and in maintaining healthy blood vessels and a healthy blood pressure. Inside the body, ALA molecules are converted into eicosapentaenoic acid (EPA) and docosahexaenoic acid (DHA), long chain omega-3 fatty acids found most abundantly in oily fish. Like ALA, EPA and DHA are thought to have important health benefits. Researchers say that the body's conversion of ALA into EPA and DHA isn't very efficient. In addition, since purslane plants are small, a large number of them would have to be eaten to supply the body's daily ALA requirement. Nevertheless, the plants can make a valuable contribution to our daily omega-3 intake. Mizuna has saw-toothed leaves and a mild, peppery taste. It’s sometimes known as Japanese mustard. It's believed to be native to China but is especially popular in Japan. Like other salad greens with medium or dark green leaves, mizuna is nutritious. It provides us with beta-carotene, vitamin C, calcium, and iron. Mizuna is eaten raw and is also steamed and boiled. In some parts of the world it's a popular ingredients in soups, hot pot dishes, and stir-fries. It's also enjoyed as a pickled vegetable in some cultures. Boiling salad greens—or any green vegetable—is not the best way to cook them. The water-soluble nutrients leach out of the leaves and enter the boiling water, which is generally discarded. Vitamin C and the B complex vitamins are water-soluble. Mizuna in a garden is known as a "cut and come again" plant. If a leaf is cut to eat, a new leaf grows as a replacement. It's important that no more than a few leaves are removed from a plant at a time to avoid weakening the plant. Tatsoi is another popular Asian salad green. It grows as a low rosette of leaves, which are dark green, spoon-shaped, and often glossy. Tatsoi has a mild flavor that resembles the taste of mustard. Its leaf shape and taste give it the alternate name of spoon mustard. I've never grown tatsoi, but it's said to grow rapidly and to be an easy plant to cultivate. Like mizuna, it's a cut-and-come again plant and is sometimes found in salad green mixes. The leaves and stems of tatsoi are usually eaten raw. The plant is also steamed, boiled, and used in stir-fries. The leaves are added to soups, but generally at the end of the cooking period so that the hot water softens the leaves without overcooking them. The leaves are also sautéed. Tatsoi contains a high level of beta-carotene, vitamin C, vitamin K, calcium, and potassium, as well as some iron. Both tatsoi and mizuna are grown as sprouts and microgreens. Sprouts are very young seedlings that look different from the mature plant. Microgreens are older. They have some of the characteristics of the mature plant but are still young and small. Nutritionists say that many of us don’t eat enough vegetables. Salads are an excellent way to increase our vegetable and nutrient intake, especially if we eat a wide variety of salad greens. Different greens contain a different combination of nutrients, so eating many kinds will help ensure that we get a wide range of nutritional benefits. I nearly always eat my salad greens raw and very rarely cook them. My favorite salad oils to enhance nutrient absorption and add an interesting taste are extra virgin olive oil and unrefined sesame oil, but there are many other healthy oils available in stores. I often add kelp or dulse flakes or granules to my salads. Kelp and dulse are good sources of iodine and have a much lower sodium content than table salt. The addition of dried or fresh fruit to salads provides extra nutrients. 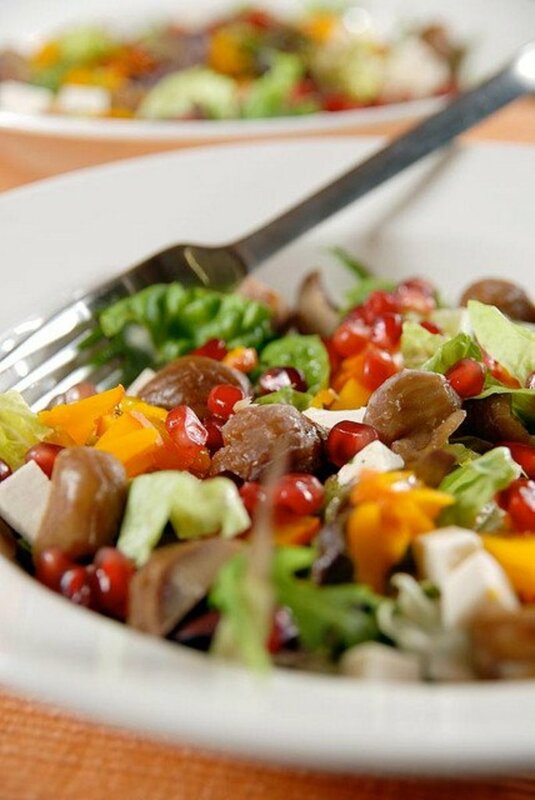 The sweet taste of fruit combines nicely with the sharper taste of the salad greens. Good dried fruits to add include raisins, currants pieces of dates, figs, dried apricots, and dried plums. Good fresh fruits to mix with salad greens include sliced apples, pears, oranges, bananas, peaches, pineapple, and cantaloupe. Grapes, sweet cherries, and berries such as blueberries and strawberries are also nice additions. 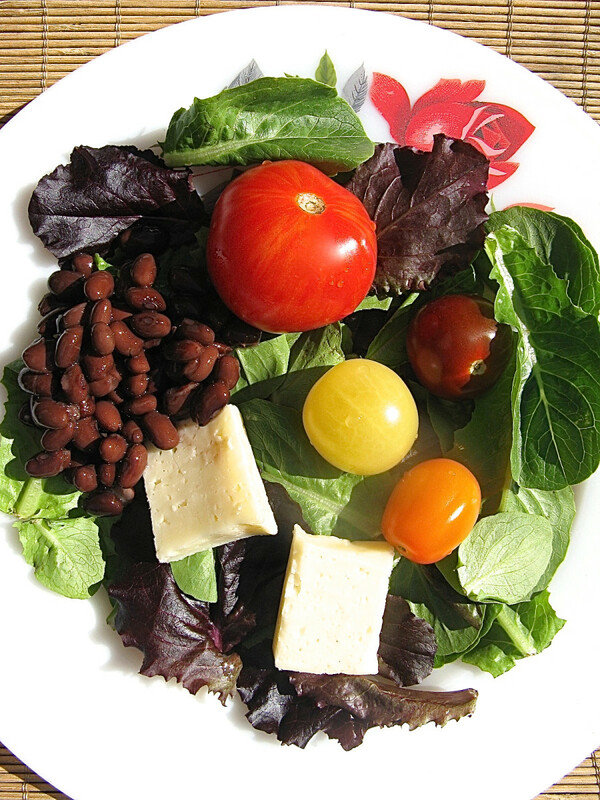 A salad can be turned into a complete meal by adding a protein such as beans. Hard boiled eggs and cheese can also provide protein for someone who is a vegetarian rather than a vegan. 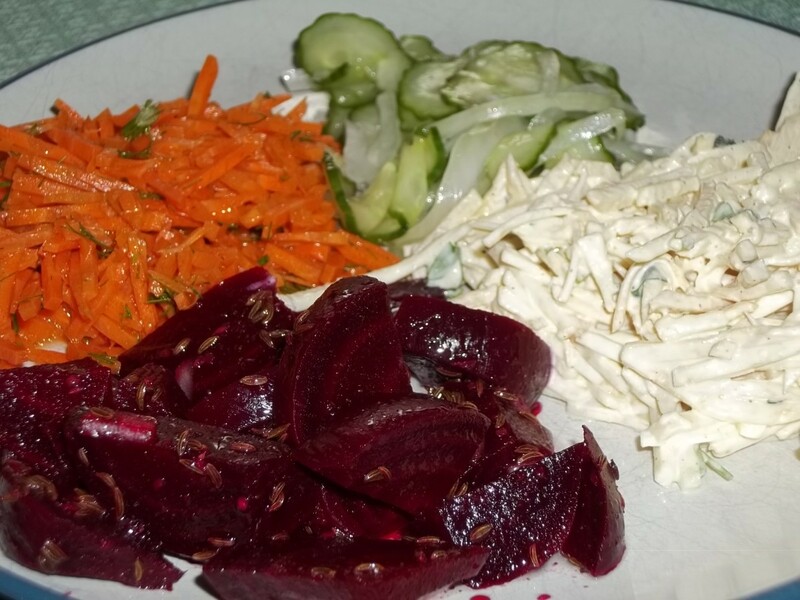 The salad can be made more filling by adding other vegetables in addition to salad greens, such as tomatoes, onions, cabbage, carrots, cucumber, sliced beets, peppers, radishes, celery, and sprouts. Nuts and seeds are great additions, too. Eggs, cheese, nuts and seeds add to the fat content of a salad, so you might want to use them instead of oil and not in addition to oil. Plain, fat free yogurt mixed with herbs, spices and a little lemon juice can be used as a salad dressing. Bags or plastic containers of pre-washed salad greens are available in many stores all year long. Spinach, romaine lettuce, arugula (also called rocket), endive, chard, mizuna, and sometimes tatsoi can be found in packages of salad greens. Although prepared greens are more expensive than fresh ones, they are a good way to increase nutrition. It’s so easy to open the refrigerator, grab a handful of greens, and add them to a sandwich or a meal. One serious disadvantage of packaged salad greens, besides the cost and the use of plastic in the packaging, is the risk of Salmonella, E. coli, or Listeria poisoning. In North America, there have been several outbreaks of foodborne illness in recent years which have been traced to bacteria growing on packaged salad greens. It's very important that prepared salads are produced safely, kept refrigerated from the time when they are packaged to the time when they are eaten, and used well before their expiry date. 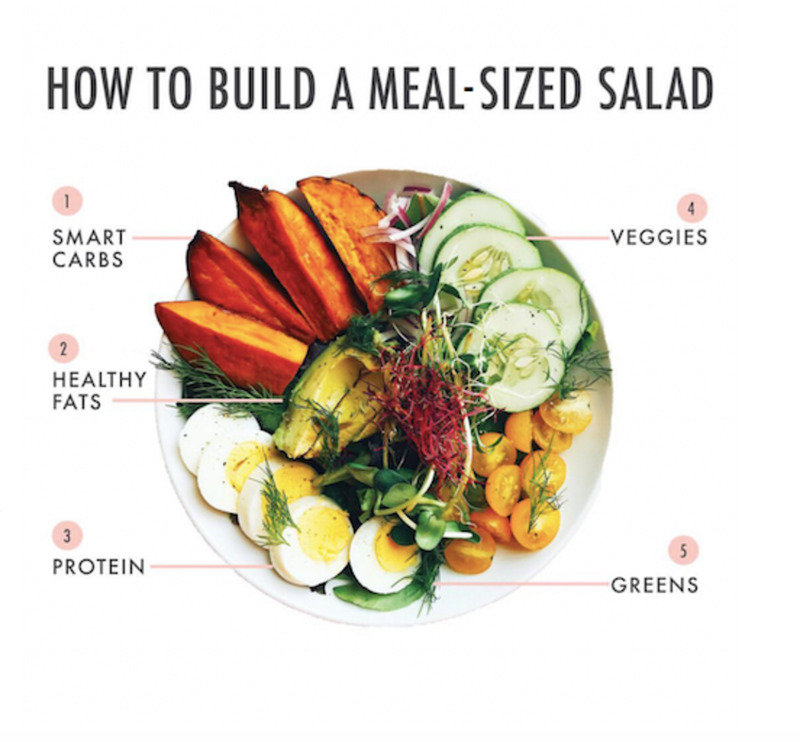 Eating salads is a great way to boost vegetable intake. 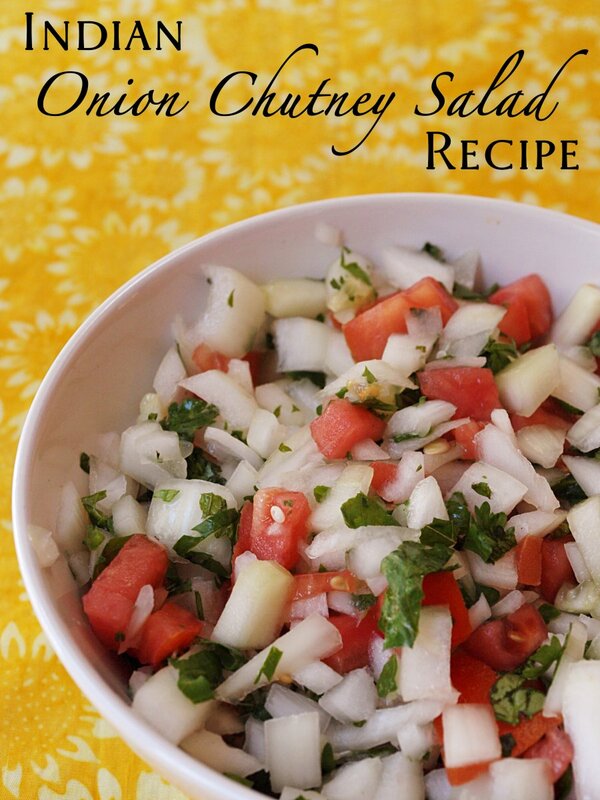 A salad is quick and easy to make. All that has to be done is to wash the greens, remove any excess water. and then add a healthy oil. Packaged greens make the process even easier. Additional ingredients can be added to change the salad from a snack or one course of a meal into a complete meal. Making a salad gives someone a chance to be creative and to discover new and delicious flavor combinations. Although salads can be made all year long, summer is the best time for someone to discover new greens that they've never eaten before or that they've never eaten in their fresh form. 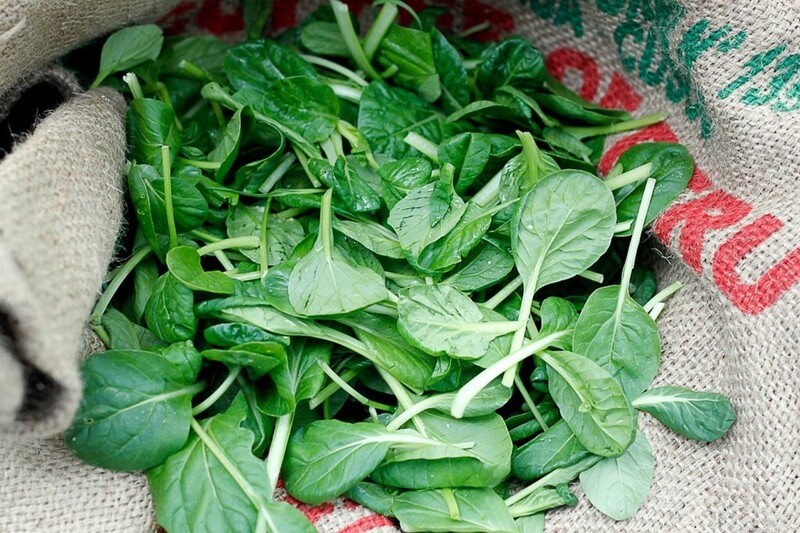 Unusual greens such as purslane, mizuna, and tatsoi are great additions to the diet. Hi, Kristen. Thanks for the comment. I enjoy eating salads too, especially when they contain a variety of greens. Great hub. I've been eating salads for a year now. I never heard of those salad greens. But I'll give them a try sometime this year. Thank you for the comment, hi friend. Hi, Chatkath. Homegrown salad greens are the best! I love the flavor of produce that I grow in my garden, then pick and eat straight away. The food tastes delicious, and it's good to know that it's nutritious too. Thank you Alicia, I love all these tasty little greens but could never name most of them. My Mom used to grow a variety of salad greens and they were so good! Turned me into a salad lover! Great Job. Hi, Tina. Thank you for the visit. I eat a lot of salads in summer too, and I love exploring markets to find new varieties of salad greens and herbs that I've never tried before. I like to experiment with new flavors in my salads. This was all new sorts of salad for me but they sounds interesting and I will try to find some in a store. I eat much salad especially during the summer period when they are fresh. Thanks for all the information about the health benefits, it is always good to know. Thank you for the comment, Movie Master. Mizuna picked fresh from the garden would taste wonderful! I'm limited in what I can grow in my garden because there are two active dogs in the family that need space to run and play, but I'll definitely have to find space for more salad greens in the garden or in a container! Hi Alicia, I love eating salad and enjoying the different varieties of lettuce, Mizuna is one of my favourites I love it's peppery taste, I have grown some this year and it's delicous straight from the garden. Thanks for sharing a great hub, I have enjoyed reading about the benefits of the the different varities. Hi, applecsmith. Thanks a lot for your comment and vote. I love eating salads, too. They're so nice to make on a hot summer day when I don't feel like cooking! It's easy to make them tasty and nutritious too. Yum! I love eating salads, especially in the summer months when the farmers market has so many varieties of food. I enjoyed reading this, and learned something new about the different kinds of lettuce and greens.